Cows are ruminants. They quickly swallow their feed and chew it later. This involves bringing the feed up from the paunch. But because of the haste with which they initially gulp everything down, they also swallow foreign particles that just happen to be in the feed: small stones or pieces of iron wire and small clamps used to attach the barbed wire to the posts that mark off the pasture. These heavier particles are not excreted with the droppings, but rather they sink to the bottom of the cow’s paunch. Strangely enough, the cow is generally not bothered by this. The cow only becomes ill if it has swallowed something sharp that subsequently damages or even punctures the reticulum wall (the wall of the paunch). This is referred to as ‘reticulitis’. 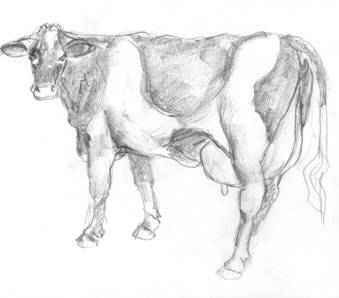 A cow that suddenly no longer eats, but rather moans, that has a motionless paunch and responds as if it is in pain when it stretches its back, is most likely suffering from reticulitis. Conventionally, the treatment of a cow with this disorder involves an operation. The animal is given a local anaesthetic and the belly and paunch are opened up with the cow in a standing position. The sharp object that must be removed is generally found at the very bottom, in the section referred to as the reticulum. In the book and film ‘Doctor Vlimmen’, a peeling knife is brought out by the surgical procedure. Since the seventies, a cow with reticulitis is usually given a bar magnet. That is a magnet that is covered by a cage of plastic bars. It is about ten centimetres long and is placed at the back of the cow’s throat. The cow swallows the magnet effortlessly and because of its weight, the magnet sinks in the paunch and reaches the reticulum where most of the foreign objects are found. Small metal particles attach themselves to the magnet between the bars. They can then no longer damage the wall of the rumen. The magnet stays in the reticulum of the cow for the rest of its life. The cow is not noticeably bothered by this. This is the seventh time within a short period that I reach the same diagnosis at this farm: the cow has reticulitis. The farmer is annoyed: “I guess you think I feed my cows nails!” I treated the previous patients with a bar magnet and antibiotics for three days to prevent peritonitis. With poor results: five of the seven have been taken over by the mutual cattle insurance and slaughtered. And number six is not eating properly either and is not producing enough milk. Something has to change. I propose to take this cow to the university clinic in Utrecht. The clinic has X-ray equipment that is so powerful that the rays can pass through a cow’s stomach. Metal objects are then clearly visible, making it possible to come to an accurate diagnosis. Or not, if I am mistaken. The farmer agrees with the plan. He wants to take along the sixth cow with reticulitis that he still has. The magnet is clearly visible on the X-ray of the previously treated cow (no. 6). Various small metal particles are attached to it. What’s more, an abscess is visible in the abdomen, between the wall of the rumen and the diaphragm. The internists in Utrecht are of the opinion that this is due to a sharp object that has perforated the rumen. But the object itself is not visible. The cow is in a poor condition and euthanasia is carried out prior to an autopsy. The sharp object that is not visible on the X-ray will probably be found during the autopsy. In doing so, the magnet is retrieved from the reticulum. Along with bits and pieces of metal. And an abscess, the size of a tennis ball, is found at the front of the abdomen. But no sharp object is found, despite a thorough search. The X-ray of the last, yet to be treated cow shows a vague object resembling a long, thin piece of wire. It has perforated the rumen. But certainty is lacking: the object is too thin and the image too vague. The conclusion of the examination therefore reads: ‘Peritonitis; possibly as a result of a perforation by a long object from the reticulum.’ Because of the peritonitis, an operation is too risky. This cow is still in a reasonable condition and is taken over by the insurance to be slaughtered by the domestic butcher in Brabant. And so my earlier diagnoses remain questionable, as they were not convincingly confirmed. Feed that remains behind in the feed alley in the middle of the barn is swept towards the cows using a large, round brush behind the tractor. As a result of wear and tear, the bristles eventually break off and end up in the cows’ feed. Back then, the bristles of the brushes were made of thin steel wire. Apparently, cows would even swallow these long wires if they ended up in the feed. 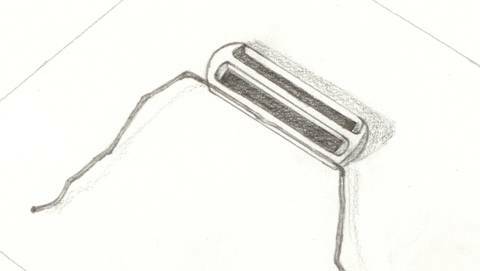 A bar magnet can catch such pieces of wire, but the magnet is too short to render the long piece harmless: one of the ends is still able to perforate the wall of the rumen. The thin iron wire then quickly becomes rusty. Nothing remains of the wire after a few weeks. Nowadays, feed brushes have plastic bristles. These do not cause noticeable problems in the cow’s rumen.